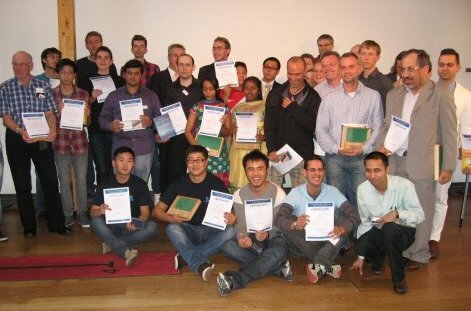 The Mental Calculation World Cup 2012 took place at Mathematikum, a science museum in Gießen, Germany. 32 calculators from 16 countries took part. The first highlight of the MCWC 2012 was a tutorial about factorization of numbers. Willem Bouman from the Netherlands presented his method for finding the prime factors of large numbers. The world cup winner in the overall ranking was Naofumi Ogasawara, a soroban teacher from Japan. Hua Wei Chan (Malaysia) came second and Jan van Koningsveld (Germany) third. The complete results can be found here. If you have any questions on the MCWC, please contact info@recordholders.org. The best place for discussions about the World Cup and mental calculation in general is the Mental Calculation Mailing List.